Printed on a linen and rayon fabric with a luxurious texture and beautiful drape, Ankara Lined Tailored Insert Valances are sophisticated in both pattern and color: the updated Jacobean design showcases a stunning color palette of greys, muted gold, and off-white against a charcoal background. 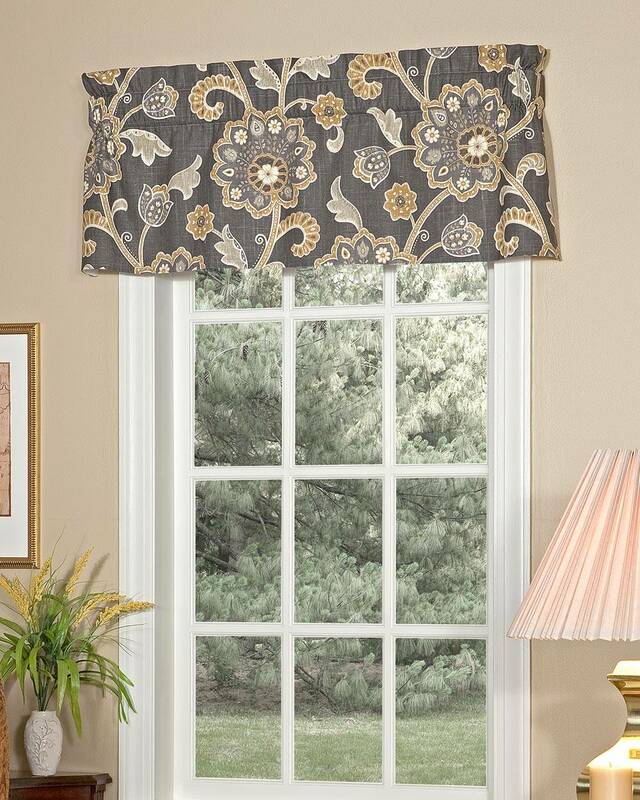 These beautifully constructed valances will enhance both formal and contemporary decors. Hang alone for single windows up to 40" wide (as pictured above) - for wider windows, add additional valances. These versatile valances can also be combined with Ankara Lined Tailored Swags to cover wider windows. (Insert valance between the right and left swag panels.) Fully lined for protection from harsh sun. A Pretty Windows exclusive - Made in the USA.